The 2019 Epcot Flower and Garden Festival kicks off March 6, and today we’ve got details on additional acts that have been added to the lineup for the Garden Rocks Concert Series. The new acts announced this week include: Richard Marx, A Flock of Seagulls, Jon Secada, Journey former lead vocalist Steve Augeri, Air Supply, Rick Springfield, Starship starring Mickey Thomas, and Blood, Sweat and Tears. The Garden Rocks Concert Series takes place nightly throughout the Festival at the America Gardens Theater in Epcot. Shows are performed at 5:30pm, 6:45pm, 8:00pm and admission is included in your Epcot admission. Guests can also make reservations for the Garden Rocks Dining Packages – offering guaranteed seating for an evening concert and a meal at a participating Epcot restaurant. You can find a full list of participating restaurants here. 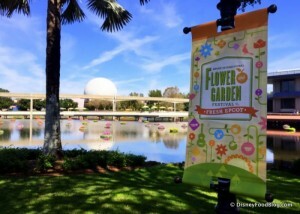 For the most up-to-date information on the 2019 Epcot Flower and Garden Festival, be sure to bookmark the Disney Food Blog’s 2019 Epcot Flower and Garden Festival page, and check out their all-new Flower and Garden Festival ebook!